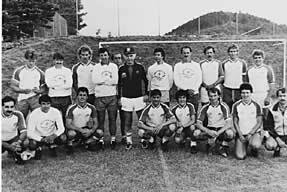 1977 Three SLU graduates in their early twenties, Larry McFaddin, Scott Williamson, Micheal “Twig” McGlynn set up the Mountain View Soccer Camp at the Northwood School – there are 23 campers, Ages 12-18. Girls camp is “primarily for local high school players” according to the brochure. 1978 SLU team members come up for training and win ICAC and ECAC crown that season. Alfred Galustian joins the now 13+ strong staff. He brings with him the Mantova Football Club from the South London. Nightly games against the staff become a camp feature. 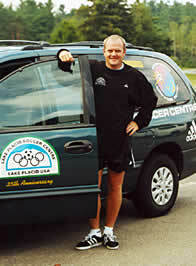 In comes a certain Pat Farmer, as Camp Director, who had just finished his USSF “A” license before the camp. Pat has quite a future ahead of him! Boys and girls combined for the week 8-18 years. Lake Placid gears up for the Winter Olympics. 1980 The camp brochure boasts “that top level amateurs” are hosted. Rockland County C.C. train at the camp. Lake Placid hosts the Olympics! More than half the camp watches the Montreal Manic in NASL action at the Stade Olympique in Montreal. In an effort to educate LPSC offers the Coaches Clinic which debuts in between camp weeks. Free overnight accommodation is offered to interested coaches. 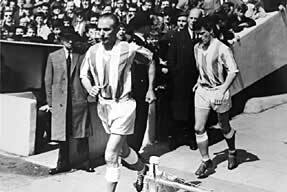 Sir Stanley Matthews between Andy Lynch and Charlie Cooke. 1982 Alfred Galustian joins LPSC staff as a Director and Sir Stan visits again. LPSC takes on the management structure that takes the organization through to the present day – the triumvirate of Larry McFaddin, Michael McGlynn and Alfred Galustian. 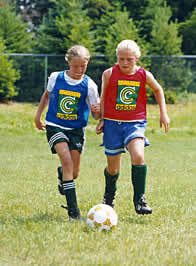 Mountain View Soccer Camp expands to 2 weeks sessions. Alfred Galustian comes on board as a director. 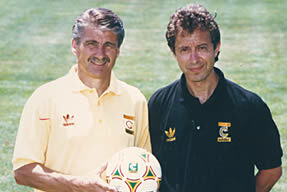 His visionary adaptation of the Coerver curriculum would set up a global skills foundation that is now used worldwide. 1983 – Sid Goodrich is brought in to spearhead LPSC’s need to start specialized goalkeeping training. 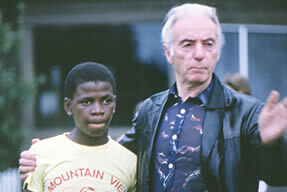 Gerald Motepane (14 years old) a black South African spends two weeks after winning a skills contest organized by Sir Stanley Matthews. It is a further 11 years before the abolishment of apartheid. May 1994 was the date when a democratic non-racial government took office in South Africa, with Nelson Mandela as President. Long Island University, coached by Arnie Ramirez, prepare for the upcoming college season at the camp. 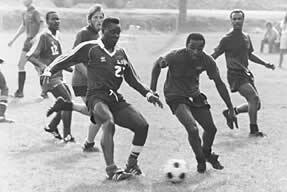 LIU were ranked the #1 NCAA Division 1 team in the nation in the 1983 pre-season poll. Action from a pre-season scrimmage held at the camp with the LIU Blackbirds taking on the powerhouse Plymouth State from New Hampshire. Kenyan Nygel Abuto Nygonj (LIU) poses with Gerald Motepane. In 1983 Nygel was the Guinness Book of World Records juggling champion (85,460 times!). 1984 – Over 400 campers in 2 weeks of camp. 1985 – The camp has now grown to 500+ campers over 2 weeks. Nike is on board as a major sponsor of the camp. Scotland international and Celtic standout Andy Lynch, now coach of the Montreal Manic, instructs at the camp. BBC film crews are present working on a documentary of the life of Sir Stanley Matthews. Can you spot the famous faces in this picture of the staff this year? The British Broadcasting Corporation (BBC) visited Lake Placid while working on the documentary about the life of Sir Stanley Matthews. By 1985, the “Milk Shake” prize celebration was an established camp tradition for teams who won the evening competitions! A young Jimmy Galustian puts the moves on. 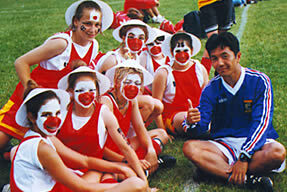 In the mid-90s Jimmy returned as a coach and camp counselor. 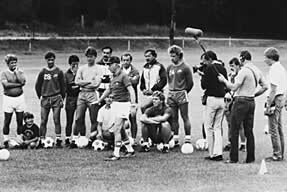 1986 -Wiel Coerver visits for the 10th anniversary of the camp and leaves a lasting impression. Alf Galustian, with the help of Charlie Cooke, start to log, embellish and intertwine Wiel Coerver’s methods and skills program theory, to form a fundamental instructional base to be for teaching. LPSC commitment to education and development of soccer expands to a series of player and coach clinics over New York state – sponsored by Pepsi. 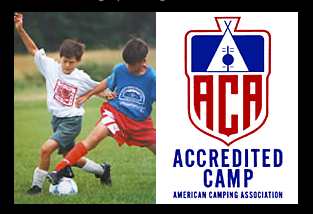 Adidas sponsors camp & the LPSC, · The camp store becomes a lot more professional, links up with Sundog Sports – a local sport firm. Wiel Coerver and Sir Stanley Matthews outside Northwood School. Billy Steffen, the goalkeeper for the Albany Capitals, now Head Coach of the Women’s team at Oregon, demonstrates at camp. 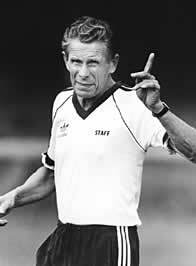 1987 – Wiel Coerver visits once more. His methods are now truly starting to influence soccer coaching methods worldwide. 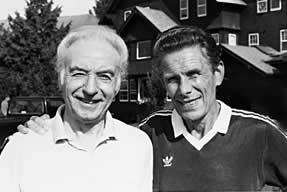 1988 – After more than two years of preparation Alfred Galustian and Charlie Cooke introduce the “Coerver Method” to the world. The resulting curriculum spawns the worldwide success of “Coerver Coaching” theory as the number one skills based methodology in the world. Current Coerver Coaching graduates who are now making their mark in world soccer include Harry Kewell (Leeds & Australia). 1989 – The camp moves to 4 weeks, with over 800+ campers. MISL All-star Ziggy Zigante demonstrates how to hold on to the ball in a specialized goalkeeping session. 1991 – Trevor Brooking, Michael Thomas, Werner Kern appear the camp. Trevor Brooking, one of England’s finest, was at camp. Face painting fun from the “World Cup competition nights” always goes over well. 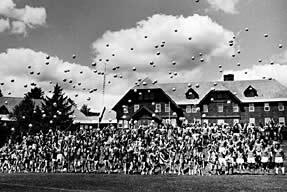 1993 – A fifth week is added, close to Lake Placid, at St. Lawrence University in Canton N.Y. The SLU facility permits LPSC to expand its soccer education program to include team training, elite, advanced goalkeeping. There are 12 full fields, Astroturf and an indoor facility. Bob Durocher, Head Men’s coach at St. Lawrence University at Canton, N.Y. Bob’s team was to win the NCAA championship before the decade was out. Scottish International John Collins visits camp. Since this time John’s recent travels as a player have seen him play in England and France for Everton, and Monaco respectively. He has just been promoted to the English premiership after a successful campaign as captain of Fulham. Congratulations! 1994 – World Cup year in USA – the fever hits the camp! The “Mighty Mites” section debuts in camp, mornings from 830-1230am for ages 5-8 years. “Futbol Mundial” the worldwide football show, syndicated in over 140 countries, visits the camp. The Mighty Mites (ages 5-8 years) debuted this year. Here are the crew in 1996. 1995 – The Team training and Advanced Goalkeeping sections debut at SLU. Bryan Hamilton, the coach of Northern Ireland national team is present at camp. 1996 – This year was the 20th anniversary of the camp and the LPSC. The camp has grown from 23 campers over one week to over 1400 campers over 5 weeks! The Elite and Advanced Select Sessions start at camp. A top Japanese team visits camp. One visitor from Japan with the “home” team during the weekly “World Cup” tourney night. 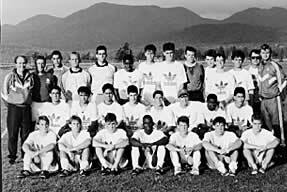 1997 – Wiel Coerver’s makes his 3rd visit to Lake Placid for the camp. 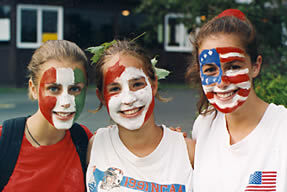 1998 The camp goes back to 4 weeks camp – 3 at Northwood and 1 week at St. Lawrence. There are now 1600 campers from 35 states & 15 countries! The Australian Coerver group enrich the camp with their visit. Camp Director Mike McGlynn poses with Lauren Gregg and the Women’s World Cup in front of the White House at a ceremony honoring the FIFA Women’s World Cup winners – Team USA. Mike managed the Coca-Cola youth programs for the ’99 World Cup. Have wheels will travel – Camp favorite coach Stewart Hemsley with LPSC van. The van means that day camps will become a regular feature of the LPSC outreach for the new millennium. LPSC will come to your community. 2000. Bruce Darien proposes the idea of s Soccer Foundation to set up scholarchips for less able students to attend the camp. Camp guest Romerito in action. Romerito was South American Player of the Year in 1985 and played for the N.Y. Cosmos, Barcelona, Nexaca, Fluminese (Brazilian champions 1985), and for the Paraguay world cup team.